Originally from Alberta, he has performed as member of or soloist with the Canadian Military, The Big Band Trio,Vancouver Island Symphony, Sooke Philharmonic Orchestra, Victoria Chamber Orchestra, La Clave Orchestra, Sidney Classical Orchestra, The Victoria Symphony, The Swiftsure Big Band, and Kumbia. 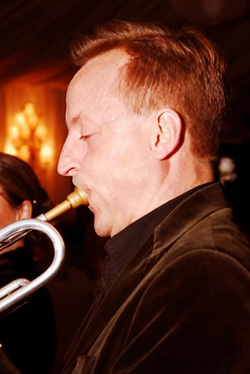 He has studied with trumpet players such as William Dimmer, Gary Guthman, Martin Barinbaum, Dominic Sperra, A. L. “Jigger” Lee and Louis Ranger. He was a finalist in the University of Victoria Concerto Competition where he received his music degree. He has been featured on many recordings, including sessions with Maureen Washington, The Axiomatics, Mindil Beach Markets, Kumbia, Gone Clear, and the Vancouver Island Symphony.